If he has his act together, Lyndon has already powered on in the copy room by the time the bell for first period rings, and has already begun the long, slow trek down the school's single hallway, arriving at his first class, chemistry, before the tardy bell rings five minutes later. But he was a little slow getting going today, so by the time he arrives at Mr. Deville's room — it's the one farthest from the copy room, if that buys him any sympathy — the door is already shut, and the halls of Knox City High are mostly empty. Since he doesn't have arms he can't turn the handle to open the door. He used to crank up the volume and yell, but that didn't really work either, so over time he learned to adapt, to use his unique gifts to solve the problem. He would back up, creating enough room to pick up speed, and then ram the door at full throttle. It wasn't too violent a collision, but it was enough to shake the door with the force of a hard knock, and after a few minutes someone always came to his aid. Oh, good, there's another boy in the hall today. Lyndon gets to spare the door and his paint job. "Can you open Mr. Deville's door for me?" He rolls to his usual spot at the front of the room, where he has a good view of the whiteboard and the teacher. But today's activity isn't quite built for Lyndon, so Mr. Deville positions himself in front of him and says: "Since so many students are at UIL" — it's an academic contest — "we're just writing addresses on envelopes for prom invitations. You don't have to stick around." So out Lyndon goes, back through the door and down the hall, back to the copy room to power down and wait for the next bell to ring. Knox City is a town of 1,300 people about 200 miles northwest of Dallas, lying along two main streets with no traffic lights. The Baty home is not far north of the main intersection, less than two miles, a simple brick house with about 70 acres of land behind it and a small free-standing office under construction out front. A yellow crop duster swoops low over the house across the street and lands on the airstrip up the road, the main landmark that lets the Batys' visitors, often news vans and eager reporters, know they've gone too far. It's mid-morning, and Lyndon is uploading an assignment. There isn't much time before class, but once he finishes he walks to the living room. It probably crosses his mind to squeeze in a quick game of NBA 2K13 on his Xbox, but he doesn't push it. He flips on the TV instead. "Lyndon, it's almost time for chemistry," his mom, Sheri, says. "Turn the TV off." "I just want to see who won the game." "I don't remember, but it affects the Knicks." Sheri is in the kitchen washing eggs, which she'll sell around town. She's a photographer — portraits and sporting events, mostly — but when those chickens are really producing they're a good side gig. She's getting six dozen boxed for an old woman in town who likes to bake. The rest of the family is long gone. Louis, Lyndon's dad, is the superintendent of the Knox City-O'Brien school district. His brothers are at school: 11-year-old Chance, who hugs strangers and offers them clementines, and Sheldon, 14, the worrier in the group. The assignment Lyndon just finished is for West Texas University, which lets students at Knox City High take courses for college credit. He's 17, so college isn't far off, a notion obscured by his still child-like frame. He can talk nonstop for hours, and if the topic is sports he goes even faster, and assumes you're keeping up with the names and stats he's machine-gunning your way. He's most obsessed with basketball, and wants nothing more than to play in the NBA. But being a fanatic is as close as he can get. With his skinny limbs and stomach swollen with a dialysis catheter, contact sports are off the table. Lyndon was born with polycystic kidney disease (PKD), a genetic condition that results in cysts on the kidneys. It's the most common life-threatening genetic disease in the world, but because Lyndon is Lyndon he was born with the rarer form of the disease, autosomal recessive polycystic kidney disease, the kind that appears in children. Louis and Sheri are both carriers for the mutated gene, which gave Lyndon a 50/50 chance of inheriting the disease. About 70 percent of babies born with recessive PKD survive their first year. But back when Lyndon was born — six weeks early, with two pounds of fluid in his chest and cyst-covered kidneys that couldn't filter — his doctors gave him two years to live. Most newborns in his condition don't live two weeks. Sheri likes to say that if there's a 97 percent chance of a thing, Lyndon is the 3 percent. He made it, despite his abnormally small stomach that could only hold so much food, despite the need for an oxygen tank and feeding tube at his crib and five different blood pressure medications, despite being on dialysis for at least 10 hours every day. That was just to see 2. As the years went on there were countless 200-mile trips from Knox City to Children's Medical Center in Dallas, for a blood clot on his fifth birthday and, finally, a new kidney when he was 7. Education in those early years fell under Sheri's jurisdiction, with Louis, a former math teacher, helping when he could. His mom became his friend, teacher and classmate, Lyndon says. But with the new kidney came real school, the real second grade, and his world opened up beyond home and to school, the world most kids inhabit. He even started running track. It was like the end of Pinocchio, if Pinocchio were obsessed with LeBron: Happily ever after. Normally ever after. "As normal as normal can be," Lyndon says. "As normal as you'll ever be," Sheri says. But Lyndon being Lyndon, the story didn't end there. In eighth grade, his body started rejecting the kidney that gave him his freedom. He went on immunosuppressant drugs to keep the kidney working, and soon he was too immunosuppressed to leave the house, except for trips to the hospital in Dallas. Or the Ronald McDonald House, which despite its best efforts was worse because there was no ESPN. In July 2010, when LeBron James told the world he would take his talents to South Beach, Lyndon was getting live updates from his dad over the phone. He spent his last summer before high school this way, masked and schlepping from Knox City to Dallas and back. When school finally started Lyndon was back to studying and working at home, but things were worse than before. Not only was it decreed that he couldn't go to school but his contact with people outside the family would be minimal. One of the few non-Batys he saw that fall was Christie Howeth, a counselor at Knox City High. Every day she would pick up the basket of assignments and handouts at school and bring them to Lyndon's house, where he would barrage her with questions. Her husband was a coach at school, so Lyndon over-estimated her sports savvy and wanted to know the inside scoop not only on local sports but on the pros, too. She became Lyndon's one-woman audience for the stats and facts he picked up from ESPN. The intermittent visits weren't enough to keep Lyndon going, though. Already spindly, he lost energy and weight. He was back on dialysis for 10 hours every night. And he missed school, which in Knox City means missing everything: It's a small school in a small town, where almost all the students are in the same classes, with the same teachers, the same programs. The distance from home to school wasn't a mile and a half. After the driveway it's just three turns — a left, a right and a left — but that's all it took to cut Lyndon off from the whole world. Before the Roomba there was just Rosie from The Jetsons, an unattainable fantasy, full of impracticalities. Having a robot use arms to push vacuums or work an iron doesn't make sense when you could just build a vacuum or an iron into it. Besides, the human shape is vaguely creepy. That one wheel she used to get around gave terrible stability. And she gave Mr. J such back-sass. The Roomba, though: The Roomba has been drifting through our homes since 2002, calm as a manta ray and placid enough for us to project personality onto it. The Roomba is the lesson to robot-kind that if they ever do rise up they shouldn't look like the bladed squids from The Matrix or the brawny skeletons from Terminator. They'll need the rounded corners of iPods, and people will coo over them like pets. The company behind the Roomba is called iRobot. That's where Tom Ryden and Grinnell More worked until 2007, when they left in search of their own robot revolution, wanting to work on something they called a "telephonic presence." They joined forces with More's neighbor, Tim Root, formerly of the videoconferencing company PolyCom. "With our backgrounds, we knew what we could do on the product side," Ryden says. "And Tim knew the software." More was the most mechanically minded of the three, and in his basement workshop they put together a prototype. It stood about four feet tall on a wheeled base, with a screen set in the top. It could be remotely controlled via wifi, and it streamed video between it and the computer controlling it. There were loose wires hanging off it, but it worked. What they'd built was basically a Roomba with Skype. It sounds like a put-down but it's not — that's pretty much what they set out to do. Their goal was to make a simple and streamlined device, the flagship product for their new company, VGo Communications. Soon they reached out to SKC Communications, a company that sells video processing products. They thought the VGo bot would be a good fit in SKC's product catalog, and SKC agreed, though Victor Cuella, a salesman for the company, still thought it would be a tough sell. "It's a solution looking for a problem," Cuella says. 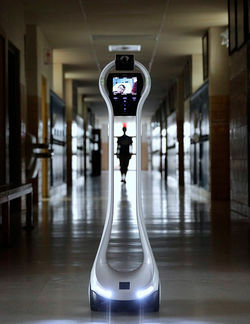 A few other companies already made teleconferencing robots. InTouch Health has a human-sized device with a rectangular midsection and large screen for a head, used for medical consulting. (A doctor can check patients and facilities at distant hospitals.) It looks more like a "robot" than what Ryden and company designed; it could have been one of the trundling R2 units the Jawas sold in Star Wars. But it also rents for $6,000 a month, as much as the VGo costs to buy. While VGo was more affordable, it was also overly simple. Many of SKC's clients looking for similar technology wanted something with more features. So Cuella started calling clients, trying to see if anyone was interested in giving his bot a test run. The first "yes" he got was from Mike Campbell, a techie at the Wichita Falls Service Center, which handled email and networking for Knox City High School. Then the weirdest thing happened: The day before the salesman arrived in Wichita Falls for the demo, the service center got a call from a woman who handles special education services for Knox City High. They had a freshman who was too sick to go to school, she said. They tried having him connect to the computers already in class but it wasn't enough. What he needed was a way to roam around the school so he could keep talking to students once the bell rang. Did Campbell have any ideas? After giving the bot a test run with Cuella, Campbell knew he had a solution for Lyndon's problem. "They called it a God thing," Campbell says. "They think it was just divine intervention that Victor showed up." That winter, around Christmas, the Batys pulled into their backyard after driving around to see Christmas lights. "Oh my God," Louis said. "The robot's here." It was supposed to go to his office, but here it was at their house, the $6,000 UPS delivery sitting on the mercifully dry concrete. Worried that Chance would get to it and do Lord knows what, Louis didn't let anyone open the box. He trucked it to his office, to wait out the winter before being transported to the copy room. Then, on the day after winter break, out it rolled, into the hallway to find a crowd waiting for it. The kids gathered around, to welcome Lyndon back and to see the robot in action. A boy named Austin was one of the first to approach. "Lyndon," he said, hugging the little bot. "I've missed you so much!" The first couple weeks were rough. On Lyndon's side the setup was straightforward enough: Wake up, get dressed, eat breakfast — all the standard getting-ready-for-school stuff. Then open the laptop and log in to school. The interface is simple and keyboard-based, which is sort of a shame, because all it needs is a joystick or proper controller for the whole thing to feel like a video game. But Lyndon never technically learned how to pilot the bot before the first day of school, so moving from Points A to B took some trial and error. He'd never even been inside the high school, so he was figuring out the controls as the same time he was figuring out the campus. "I ran into doors," he says. "Teachers. Bathrooms. Girls." At school the bot's novelty wore off fast, but it was even more valuable than expected. Lyndon's wisecracking and attention-loving nature didn't just make it easier for people to interact with him; it's what's kept him engaged. When Mr. Moeller had to chew out two girls for picking on Lyndon via the robot — taping paper over the camera eye, picking it up from behind and turning it around with Lyndon unable to see the culprits — their response was: "We'd be picking on Lyndon the same if he was here." "His personality helps out a lot," says Kent Deville, Lyndon's chemistry teacher. "A shier kid would have problems." Lyndon isn't afraid to call out when he needs help, and he uses the bot's tricks to his advantage. He can zoom in, take photos of the whiteboard and homework corrections and refer back to everything later. "It's like H.G. Wells," Mr. Deville says. Kelsey Vasquez, a classmate, says Lyndon is actually more outgoing as the robot. "He's shier in person," she says, at least until he's had time to relax. "I don't think I could be as happy as he is." His health improving, Lyndon also found a way to indulge his fixation on sports. Doctors said he could make the open-air walk through the crowd and stands up to the announcer booth. He just couldn't spend eight hours a day in the petri dish that is a high school. So he started announcing at baseball games for the Knox City High School Greyhounds. The voice that boomed out of the tiny body and those loudspeakers could draw out "Your Knox City Greyhounds" like an opera singer. Lyndon got to make as much noise as possible, and he decided on the career tracks that made sense for him: sportswriter or commentator. He branched out to football games, too, foghorning the "BU-ULL DO-OGS." But he likes baseball more because there's more dead time he gets to fill up. The sports-fanatic quasi-cyborg even got ESPN and Sports Illustrated's attention. The biggest surprise came in February. Dallas's NBC 5 took him and his family to see the Mavericks, Lyndon's favorite team. Then Lyndon got to meet the entire team. It was all organized in part by then-Maverick Delonte West, who had heard about Lyndon and wanted to do something for him. Lyndon stayed at the stadium until 2 a.m. shooting hoops with West. He now has a pair of Dirk Nowitzki's shoes on display in his room, where jerseys and pennants hang from the walls and his bedding is Mavericks blue. This is where Lyndon works when he doesn't want to sit at the kitchen table, on a desk set up at the foot of his bed. Working on a computer screen frees Lyndon to multitask. He's on Twitter a lot: "Watching LeBron play basketball is like watching the sunset. So beautiful." It also helps when he needs to Google the answers to things that aren't technically cheating, like when Mrs. Martinez, his English teacher, is giving them riddles. Other times it makes things that might be technically cheating a little harder, like in algebra one day, when the girl next to him tapped loudly on the microphone. "Then give me the answer to number six." His math teacher was in the back of the room, but Lyndon's volume carried. "I can hear you, Lyndon," she told him. Lyndon woke up on a helicopter. It was the middle of the night in July 2012, and the last thing he remembered was going to sleep at home. Now he was en route to Children's in Dallas. His parents had found him walking around the house in the middle of the night, talking to himself as if he was sleepwalking. But he wouldn't wake up. Panicked, they rushed to the local emergency room, where they put him on the chopper to Children's. At first the doctors in Dallas agreed: sleepwalking. But then it started happening more often. The spells, as the Batys call them, came intermittently for a few months. Lyndon would go a bit loopy, then snap out of it after a few hours, never long enough for them to rush Lyndon to Dallas. He always came to on the ride to the hospital or 10 minutes after walking into the lobby. But as time went on the spells got more severe and started to last longer, sometimes a day or more. One time, 16-year-old Lyndon rationalized that he was 12. Surely, he thought, he was younger than his 14-year-old brother Sheldon. And he was certainly older than 11-year-old Chase. But he must be closer to Chase than Sheldon. So that would make 12 and not 13. Another time he just looked up at Sheri and said, "Mom, you're the smartest person in the world." "I knew something was wrong," Sheri says. "That's just not something a 17-year-old says." In December he got violent. He didn't recognize anyone in his family, and when Louis and Sheri called an ambulance it took all four of them — his parents and the massive EMTs — to restrain him and carry him to the ambulance. The immediate aftermath: a missing shoe for Lyndon, and broken glasses and bruised jaw for Louis. Even a small body can do a lot of damage when you're not present enough to hold anything back. "I thank God Chance was sleeping," Lyndon says, "because I would have tried to fight him." They put him in the ICU, and this time Lyndon didn't resurface for three days. Louis had gone with him, and when Sheri arrived, Lyndon, in his daze, had a present for her. "He handed me a drawing and said, 'It's a cat.' He had just taken a pencil and done a long scribble from one corner to another." The doctors pinpointed the immediate cause: ammonia. A normal ammonia level is anything in the range of 15-45 micrograms per deciliter. At his worst Lyndon was hitting levels of almost 200. Since he had liver problems, the doctors thought it was hepatic encephalopathy, a condition caused when the liver can no longer remove toxins from the blood. The chronic form is untreatable, and its prognosis is irreversible coma, and death. "This is just how he'll be from now on," they told Sheri. Sheri was prepared to deal with whatever problems Lyndon had. She believed that God didn't do anything without a reason, that every hardship came fully equipped with a life lesson. She learned how to work oxygen tanks and feeding tubes and was an expert on Lyndon's medical records, a catalog of one challenge after another. It's not surprising, then, that it was Sheri who finally asked a doctor whether the problem could be hormonal. "Lyndon never went through puberty," she said. "Isn't there a chance that there's something wrong with his hormones?" It did make sense, the doctor thought. All it took was one more blood test to find the culprit: the thyroid. Hashimoto's thyroiditis occurs when the body's immune system starts attacking its own thyroid gland. It can happen to anyone at any age, but it mostly happens to middle-aged women. It's the most common kind of "hypothyroidism," when the gland isn't producing enough thyroid hormone for the body. Hashimoto's encephalopathy is a much rarer associated condition. Its symptoms include disorientation, delusion and aggression. The doctors gave him new medication to counteract the lack of thyroid hormone and overnight the spells vanished. Lyndon woke up the next morning and looked around. "Why am I in the hospital?" A clown marches through the lobby at Children's, yelling hellos to everyone in proximity, pulling another behind in a wagon while she plays a ukulele. Lyndon is on a laptop, pulling up the controls for his bot. "I'll trade you that laptop for my uke," the wagon clown says as she thrusts her tiny instrument at him. "That's like Deal or No Deal," Lyndon says. "No deal!" "You get your own reporter!" says marching clown. "Are you gonna be on TV?" "I've already been TV. This is for the newspaper — the Dallas Observer." "Oh, so you're getting observed?" Lyndon and his parents have made a point to share his story as much as they can — on CNN, NBC, Sports Illustrated and ESPN, German and Japanese film crews, The Huffington Post, The Daily Mail and Geekologie. They want any kid in Lyndon's position to know that there are options. 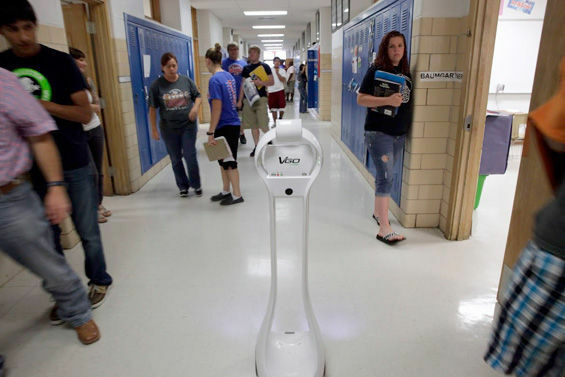 VGo now has robots in nearly 30 schools across the country. And they're still expanding. There's Devon Carrow, the 7-year-old in West Seneca, New York, with deadly allergies. There's Miranda Garcia, the third grader in San Antonio with a lupus-weakened immune system. And Aidan Bailey, the Iowa elementary schooler who had a double lung transplant. Lyndon, meanwhile, is back for another stay at Children's. Last month, Louis and Sheri noticed that his dialysis fluid was murky. He had an infection in his catheter, and it needed to be removed. That meant surgery to take it out, a couple weeks in the hospital for the infection to clear up and surgery to install another. He'd be in the hospital during state testing, so he'd have to make that up in the summer. But there was a bigger conflict, one that meant they couldn't — wouldn't — leave Knox City on April 12, when he was supposed to drive to Dallas: prom. Lyndon had a date with Andrea, who by Sheri's reckoning was the most sought-after girl in school. He may have asked her out by text, but he swears it was his only option to get it done quickly. "I can get a girl when it matters," he says. They decided Lyndon would stay at prom as long as he felt well enough to stay. "We just told him, 'You tell us when you have to go,'" Sheri says. "We wanted him to have the experience and say he went to prom." Lyndon wanted to drive Andrea and him — no robots allowed — but his belly was too sore to even properly put on a seatbelt. So Andrea's sister, a senior also heading to prom that night, drove them. The dance had a Hollywood theme, and all the couples walked down a red carpet into the new Knox City community center while a teacher announced their names. Then everyone sat down to dinner. There was shrimp cocktail — "I would die for shrimp," Lyndon says — and steak and cheesecake. Sheri was the photographer, and the one thing Lyndon was positive he did not want to miss was getting a picture of him and his date. Around 90 minutes in, the dancing started, but Lyndon felt too bad to dance. They did their best to draw it out before he told Andrea goodbye and climbed in the passenger side of his dad's truck and they headed for the highway. It's a familiar drive but a long one, three and a half hours without traffic, but it feels a little shorter when you're thinking about next year's senior prom. Click here to read the article from The Dallas Observer. Click here to watch the ABC/ESPN Video about Lyndon from 2012.